2. Do I Lose My Military & VA Disability Benefits When I File for SSA Retirement Benefits? 3. How Much Will I Get From a Divorced Spouse's Social Security Benefits? As with any other career, those in military service eventually want to retire. Although it will be a reduced amount from what you made during your working years, once you reach the minimum age, you’ll qualify to receive Social Security benefits. Generally speaking, your military retirement pay will have no impact on the amount of Social Security you’ll receive, but your survivors’ benefits may be affected. Your military retirement pay will not affect your Social Security earnings, but survivors receiving military benefits may see a difference in the survivor benefits you’d receive from Social Security. One of the rewards of serving in the military is a robust retirement system designed to take care of former servicemen. As long as you meet the minimum years of service, you can retire as early as age 37. You’ll need to remain in the military for at least 20 years to qualify, though, and you’ll only get a percentage of the pay you received when you were active. As with nonmilitary retirees, full Social Security benefits for veterans kick in at age 67 if you were born after 1959. Those born between 1938 and 1959 can earn full benefits at age 66, while those born before 1938 were able to take benefits at age 65. You can start taking benefits as early as age 62, but the amount you’ll receive will be reduced. One area where you may see a conflict is if you are a survivor of a retired military serviceperson. The military’s Survivor Benefit Plan lets a retiree pass his military service benefits on to his survivors after death in the form of an annuity. This coverage is purchased by the military retiree at the time of retirement. However, the benefits paid under this optional plan could be affected by the benefits provided by the survivor benefits provided under Social Security. Those are the Social Security benefits paid to your eligible family members if you die. Do Servicemen Pay Social Security? In addition to your retirement pay, you receive Social Security payments after retirement. This is money you paid in throughout your work in the military. If you worked outside of the military before, during or after your military retirement, you paid money in to your Social Security. Even inactive duty activities like serving in the Armed Forces reserves will also put money toward your post-retirement Social Security earnings. For those who served in the military between 1957 and 2001, there may be special credits added to your record. These credits may either increase your Social Security earnings or help you qualify for Social Security when you wouldn’t have otherwise. Those who served between 1957 and 1977 will get $300 for each paid active duty calendar quarter, while service between 1978 and 2001 will get an extra $100 for every $300 in active duty basic pay, to a limit of $1,200 for each year. Those who enlisted after Sept. 7, 1980, who didn’t complete at least 24 months of active duty service or a full tour may not qualify for those credits. The retirement pay you’ll get for your military service depends on the date on which you enlisted. Those who entered the military before Sept. 8, 1980, will get military based on final pay. If your entry date was between Sept. 8, 1980, and Aug. 1, 1986, and didn’t choose the Career Status Bonus and REDUX program, you will get pay based on the average of the highest 36 months of basic pay. If your entry date was after Aug. 1, 1986, you’ll also get pay based on the average of the highest 36 months of pay. Once your basis is determined based on your join date, that number will be applied to a multiplier. If your basis is your final pay or highest 36 months, known as High-36, you’ll multiply the number by 2.5 percent per year. If you chose the CBS/REDUX retirement plan, though, you’ll use the multiplier, but you’ll have one percentage point deducted for each year you’re short of 30 years of service. Unless your retirement pay is based on an eligible disability, your retirement pay will be taxed as ordinary income. However, if part of that pay is deducted for the Survivors Benefit Plan, that amount can be excluded from your taxable income. It’s important to note, though, that none of that retirement pay will have Social Security taxes withheld from it, even if you retire at a relatively young age. The good news is that your benefits will not be taxable. This means you can enjoy perks like education, insurance proceeds and benefits under certain grants and assistance programs. If survivors of a deceased military professional receive a death gratuity, that amount is also excludable from taxable income. Once you become eligible for Social Security payments, a new concern emerges. If Social Security income is all you have coming in each month, you likely won’t have to worry about paying taxes. However, Social Security benefits for veterans means combining it with your retirement pay. That can bring concerns that your combined earnings may exceed the amount allowable before you must start paying taxes on your Social Security income. For tax purposes, only earned income is considered when calculating your combined earnings. Retirement earnings aren’t considered earned income ­– generally, that refers to money you make through a job or interest and dividends. Military retirement pay is not considered earned income, so it won’t affect the taxability of your Social Security checks each year. In addition to Social Security benefits for veterans, the SSA provides disabled veterans disability, provided their injury qualifies. To qualify for Social Security disability, though, you’ll need to meet their definition of fully disabled. The VA offers disability to some veterans, but you don’t have to be fully disabled in order to qualify. You’ll be given a rating, and that rating can go as low as 10 percent. The good news for disabled veterans is that you can receive both Social Security and VA disability at the same time, as long as you qualify. Getting one does not influence whether you’ll be approved for the other, and receiving one doesn’t reduce the compensation you get from the other. That means you can have both streams of income coming in at the same time. The process of applying for Social Security can take time. For those who are disabled, though, there’s another perk to consider. If you were disabled during military service and earned a rating of 100 percent permanent and total, your application will be expedited. It’s important to note that this does not guarantee you’ll be approved for Social Security benefits. It simply pushes your application through more quickly. To get this expedited service, you’ll simply need to apply by making an appointment with your local Social Security office or completing the online application. The Social Security Administration will automatically identify those applicants who have been rated 100 percent P&T but in very rare cases, you may have to let them know and provide the letter from the VA notifying you that you qualify. 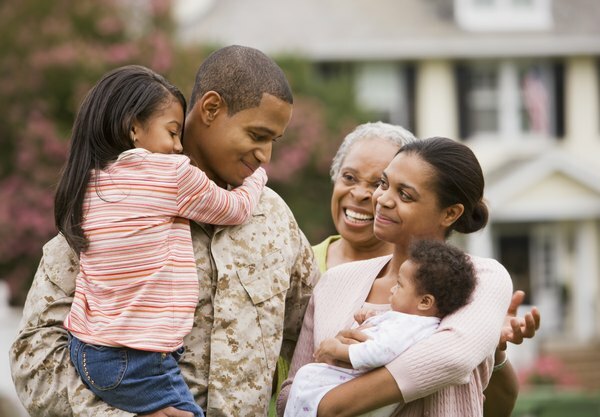 What Happens to the Benefits When a Woman Is Married to a Retired Military Man? Is There a Cap on Two-Earner Social Security Retirement Benefits? Are Social Security Benefits Reduced If You Receive Military Disability Payments?